Together we can make a difference! The mission of 3Strands, a California-based 501(c)3, is to unite and mobilize a global community of individuals and organizations to combat human trafficking through sustainable employment, education and empowerment initiatives. 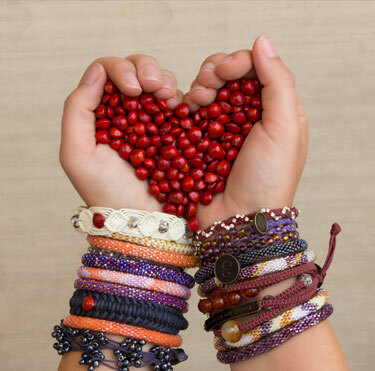 The organization has been historically supported through the sale of handmade bracelets created at the employment centers in Cambodia, Nepal and Haiti, community member pledges, events and corporate sponsorships. 3Strands sells handcrafted products, with 100% of the profits of the product sales going directly to support victims of human trafficking. Through the sale of every 3Strands bracelet created in Cambodia and Nepal, funds are raised to help empower, teach and employ young women. Country Visions, Inc. and Apricot Lane Boutiques are proud to support such an incredible, worthy cause. 3Strands bracelets can be found online and in many of our stores! Visit 3strandsglobal.com to take action & get involved: Join, Shop, Run, Host, Volunteer & Educate!